Folders are useful for grouping related files e.g. meeting minutes. N.B. Please ensure that you are not in breach of copyright law when adding folders of files to Moodle e.g. files such as scanned chapters from books or journal articles downloaded from the internet must not be uploaded to Moodle. 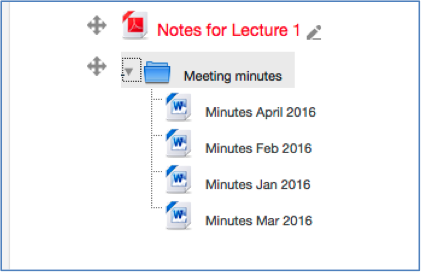 Click Add an activity or resource, scroll down to RESOURCES, select Folder and Add. 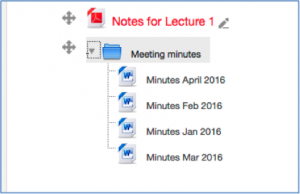 Provide a name and optionally a description for the folder. To select file(s) from your PC, choose Upload a file (on the left), Browse to locate the file and Upload this file. 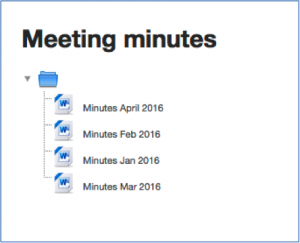 Repeat the process for each file to be included in the folder or add a single zip file containing the files. 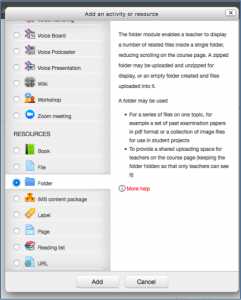 You have the option to change settings on Display folder contents and Show subfolders expanded, however, the default settings are usually recommended to maintain a compact course page. On completion, Save and return to course. As with other additions, the folder appears at the end of the section. Move it as required using the move icon . 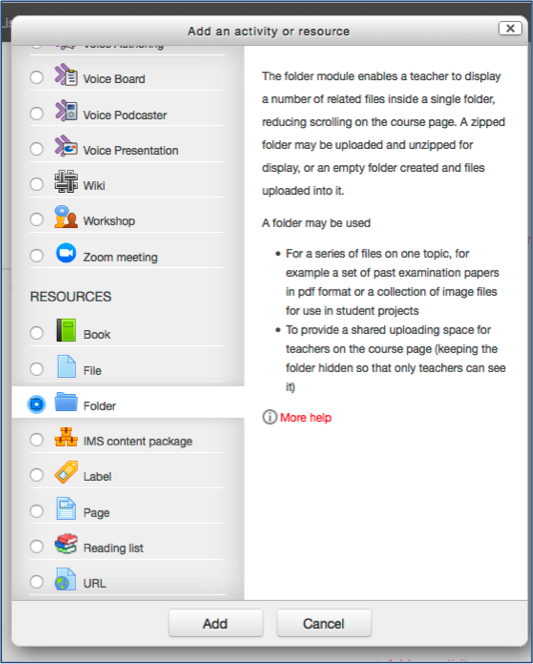 Choosing Show subfolders expanded (in addition to inline …) means the folder appears expanded when the course page opens.